In a SHTF scenario, you will probably not be able to visit HappyFitness Gym, but you still have a need to exercise. ReadyNutrition Guys and Gals, it’s a new year and there’s still work to be done! Yes indeed, speaking for myself here in Montana, I’ve been shoveling snow every day for the past week. Doing this helps me to do things, such as pull my vehicle out of the driveway, different structures on my property to not collapse or be buried…little things such as that. Some days it has been dumping almost a foot of snow on me, and most I see about 4 to 6 inches. What a pain! But it’s not all complaints in this department, as it serves a purpose that perhaps you, too, can “latch” onto to make your own. I’m referring to your daily activities for use as exercise. When I shovel (I don’t like snow-blowers, and prefer the shovel…grid down, I still can remove snow), that counts as a workout. Especially if it’s between 1-2 hours per day. That’s just simple maintenance; however, I take it as a workout. You can too! This is not to say that I don’t lift weights on these days, but as a workout, my “yard work” supplements (or complements) the lifting. Before I shovel, I tend to stretch out for about 5 minutes with some deep knee bends (squat thrusts) and arm circles, as well as stretching out my chest, arms, and shoulders. The snow-shoveling forces you to use your hip flexor muscles, as well as accessory muscles of breathing, such as interior and external obliques and transverse abdominus muscles, all located on and near the stomach. In the gym, it would be hard to duplicate some of the motions you pursue in the mechanics of the shoveling. I estimate with a damp, “wet” snow, each shovel I fill up weighs about 15 lbs. or so. After you have done that several thousand times, you can see the point. You also work on regulating your breathing. I have a pattern of filling up and moving ten shovelfuls, and then taking a breath for a few seconds…assessing my work remaining. It is good for the cardiovascular, as well. To digress, the same runs for cutting and chopping wood. Splitting wood is good for your arms, shoulders, and back. You also practice some hand-eye coordination, and I’m here to tell you…you split a quarter or a half a cord with an axe? You’ll get a good workout, believe me. 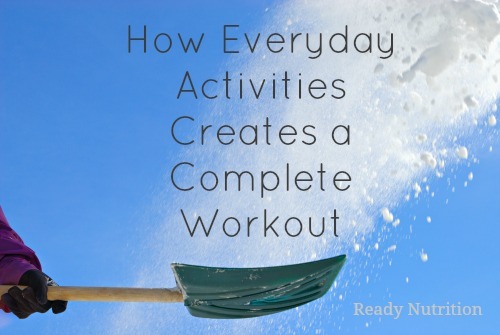 You should log all activities in your workout book. I’m a believer in workout notes, because you can see what gains you make, what problems you face, and you can perfect your activities and training program, changing it to suit your needs. With your woodcutting and snow-shoveling, note down the time you worked and the amount you moved (an estimate: it doesn’t have to be down to the pound). It is also important to factor in a recovery, and here’s a rule that doesn’t require supplements. You should consume some protein and carbohydrates within ½ hour of finishing strenuous activity. The reason for this is twofold. After a workout, your body breaks down tissues that will immediately scream for protein to repair them. In addition, you need to infuse some carbohydrates into your system, because if your body doesn’t have the energy to begin the conduct of repairs, it will break down muscle tissue in order to secure that energy supply. This article is not for the purpose of covering anabolism and catabolism or the glycogen cycle; however, you need to follow that guideline after your workout is complete. And what if you don’t live in the Rocky Mountains? And what of it? You can still figure out what you do during the course of a day that is a “natural” form of exercise. Are you a waitress or a health care professional? Secure a pedometer and use it to figure out how many miles a day you walk. Tie this in with your functions. Many professions require a person to sit behind a desk all day. Do you live within walking distance? Well, this needs to be factored in, and you can figure out whether or not it gives you some of the exercise that you need. Bicycling to and from work may be another method, if you live too far to walk and have a profession that requires more cerebral than physical activity. Those in lines of work that require a lot of physical activity tend not to regulate them (in thought); nevertheless, they reap the benefits of consistent physical activity, such as construction men and bricklayers, as well as steelworkers or dockworkers. Look at how those guys (and gals) are built, and tell me they’re not benefiting from the physical labor. When you’re home and have yard work of any kind, incorporate the task and turn it into physical training for yourself. In a SHTF scenario, you will probably not be able to visit HappyFitness Gym, but you still have a need to exercise. It lowers the triglyceride levels of the bloodstream and builds up the muscles and stamina. Exercise is a life-long function that needs to be pursued. Consult your doctor on all routines you’re considering. So, Happy New Year, and I hope this year brings you success in your physical training programs…one that you can potentially fill with your everyday work. In the meantime, I have about three inches of snow to shovel, now, so I’ll catch you later! JJ out! I love this approach, and that is a good reminder about stretching before strenuous activities and eating afterwards, even if they are not primarily workouts. One thing I found amusing when I had a (working) snowblower, I spent as much time and energy using it as with a shovel, I just did a much more thorough job and moved a whole lot more snow with the machine. But it really wasn’t worth the cost of maintaining it. There you go JJ, making sense again!